Shamrock Promotions has announced that the first professional boxing show in 2017 will be held at The Halls on Friday 3rd March. For the first time Zaiphan Morris the people’s champ headlines the show as he contests for the British Classic Challenge Belt. Known as the people’s champ or “Z-man”, Morris has an undefeated professional boxing record of 9-0-1 and been waiting for this well deserved opportunity for a while now. On the undercard Nathan Dale makes his return to the ring as he looks to put himself back in contention for titles. Connor Vian makes his professional debut on the night. Scott Moises “The Iron Duck” continues on his comeback with his charismatic performances and entertaining boxing style. 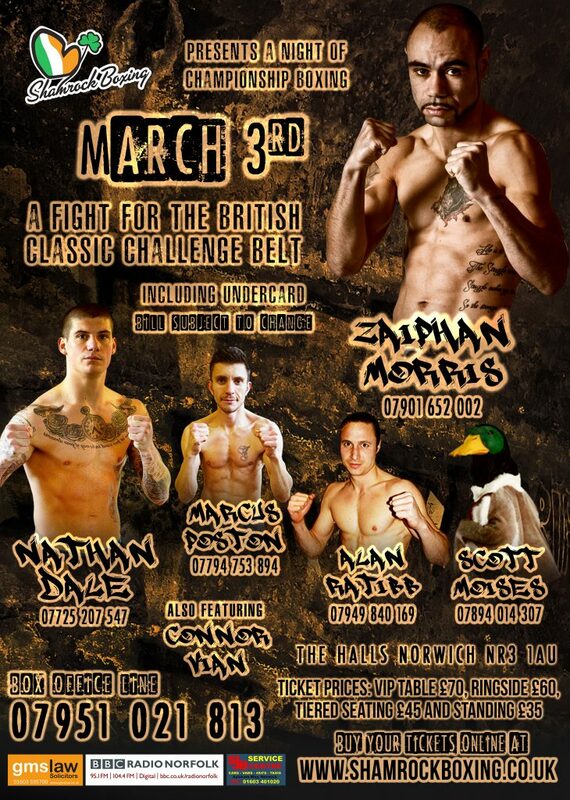 Alan Ratibb “The Iron Turk” is back in action and looking to prove himself after his previous win. Marcus Poston will be looking to put the record straight after defeat last time out in Norwich. Hi, where I can get a tickets? Any possibility to buy tickets online?